Use this excellent time-saver to mix your colors right in the cap holder with this Battery Operated Ink Mixer (2 AA batteries included). Ink Mixer measures 5" long, is made of Plastic and Brass, and has a Plastic stir rod which is removable for washing and replacing if necessary. 40 1/2 oz. Bottles of Permanent Tattoo Ink. Easy to use Smooth/Reformulated Inks for better density/quality. NOTE: Not intended for use around the eyes. 40 COLORS INCLUDED ARE: 1) Peach, 2) Dark Purple, 3) Dark Yellow, 4) Salmon Pink, 5) True Green, 6) New Red, 7) Horizon Blue, 8) Petunia, 9) Apple Green, 10) Orange, 11) Blood Red, 12) Bluebird, 13) Midnite Black, 14) Venetian Brown, 15) Poppy, 16) Violet, 17) Jumbo Gray, 18) Arctic White, 19) Dyn-o-Mite Red, 20) Dragon Green, 21) Turquoise, 22) Bluejay, 23) Irish Green, 24) Light Orange, 25) Dusty Rose, 26) Lavender, 27) Russet Brown, 28) Lava Red, 29) Sun Yellow, 30) Montery, 31) Amazon, 32) Sea Green, 33) Indian Red, 34) Teal, 35) Mohawk Yellow, 36) Lily, 37) Pacific Blue, 38) Leaf Green, 39) Safari Brown, 40) Dark Orange. This product is from Japan and is renown for it's Blacker/Clearer qualities, it produces dark bold lines lines which stay dark and are less likely to blue out over time. The Kokkai Sumi product (along with the Kuro Sumi seen below) are amongst the best Lining Inks for Tattooing. This product is from Japan and it produces lighter lines than the Shading Ink seen above. This product is from Japan and is renown for it's Blacker/Clearer qualities, it produces dark bold lines lines which stay dark and are less likely to blue out over time. The Kokkai Sumi product (along with the Kokkai Sumi seen above) are amongst the best Lining Inks for Tattooing. 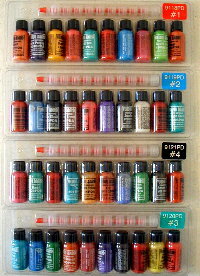 These #9 Durable Plastic/Disposable Tattooing Ink Caps are used for Holding Ink During Tattooing. The Caps should fit most ink cup holders sized in the range of #9 or #16. This Ink Caps Holder is made of a Sanitary Plastic and holds Eight #9 Tattooing Ink Caps. This Ink Caps Holder is made of a Sanitary Plastic and holds Eight #16 Tattooing Ink Caps.